It’s funny how we seem to end up with so many old, unwanted CDs just lying around. After switching over from CDs to an MP3 player or cleaning out all of those old CD-ROMs you’ve had since you got your very first computer, you might wonder how to dispose of those stacks of CDs in an Earth-friendly way. 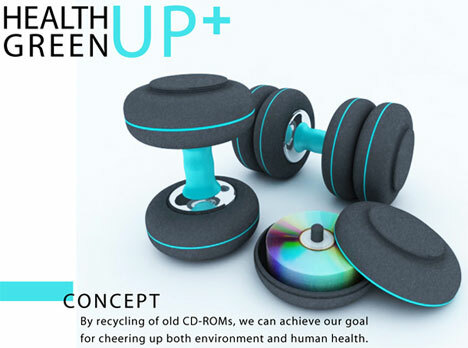 The Health Green Up CD Dumbbells concept from Seung-il Kim is a fun way to recycle while shaping up your physique at the same time. It may not exactly be a revolutionary concept, but it’s a cute idea for anyone who has ever wondered what in the world to do with all those old CDs. It seems a shame to throw them away, but since you can’t recycle them you might as well find something to do with them. And who couldn’t use a little arm toning? 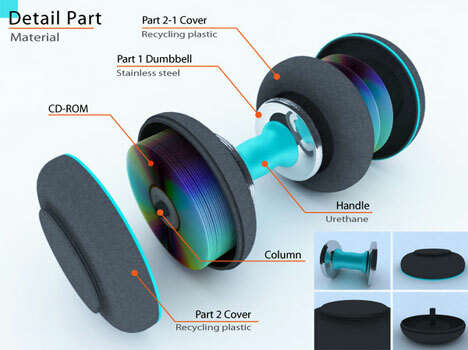 The dumbbells are basically plastic handles with attachable CD cases. 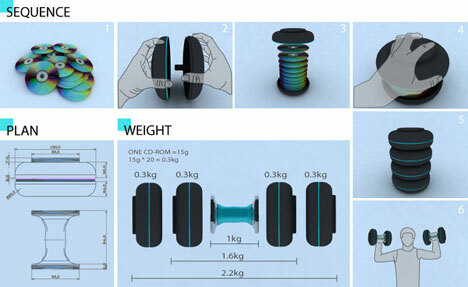 Each CD adds 15 grams to the weight of the dumbbell setup. When the CDs are put into the cases and then attached to the handles, some reasonably heavy dumbbells can result. Maybe not heavy enough to take you from flab to fab in 30 days, but they’re probably great for keeping your blood pumping while you’re slaving away in the office. See more in Unbuilt Concepts or under Technology. October, 2011.